I just love white on white, especially in the summer months! It's so crisp and the perfect blank canvas for accessorizing. This Dot Lace Peplum Tee is marked down to $17.50 at LOFT! It's so pretty and feminine. I love the boho vibe of this top and the dot trim detail. It comes in 4 other colors, too! For a white on white look, I paired the top with my LOFT Modern Skinny Jeans. They are currently 50% off! White jeans are a summer wardrobe staple, and I definitely recommend these if you're looking for an affordable pair! I love how bright colors look against white! I went with pops of hot pink for this outfit- one of my favorite colors for summer! Last week I bought this gorgeous beaded wristlet/clutch at Nordstrom. It was a part of the half yearly sale, so I got it for 40% off! I love the colors, mixed metal beads, and tassel! It sold out quickly, but this Steve Madden beaded clutch is pretty, too. Lace up shoes are on trend this year and these Simply Vera Wang heels from Kohl's are amazing! They are available in 3 colors- blush, black and cognac. I'm wearing the blush color and sizes are limited online, but they have most sizes in cognac and black. These heels are on sale for $49.99 and if you have the credit card you get great coupons and can get them for less! Since the shirt has a lot of detail, I skipped a necklace and went with statement earrings, bangle bracelets and a watch (on sale). 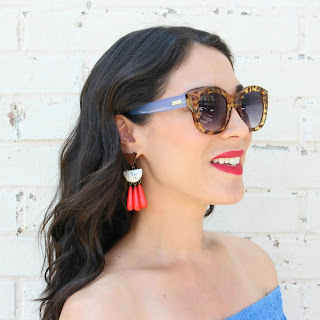 The Ophelia Earrings from Trading Hope are beautiful and lightweight! They are currently my favorite earrings. They are handcrafted in India and are $28. Thanks for reading...have a great day! If you liked this post, be sure to follow along on social media! I HAVE to try this, you look stunning. All of it, seriously!! I love white on white!!! That top is perfect. I need to get that!!!! Thanks girl! You should def get the top...so cute for summer! Oh Tamara you look so pretty in all white. I love and need your top and sandals, both so pretty. You look gorgeous! Don't forget to linkup with me pretty lady. Welcome. Enjoy the weekend beautiful! YES! All white with blush and bright pink accessories! That clutch is fabulous, too! Great look.